A tsunami is a series of long, high sea waves caused by a disturbance in the water. This disturbance can come about in many ways such as an earthquake, landslide, volcanic eruption, or meteorite. The most common causes are volcanic or earthquake activity, and the disturbance itself causes abrupt movement of the water column. Tsunamis are different to the ordinary undersea currents, as these are caused by the gravitational pull of the Moon and Sun, resulting in tides, while some sea waves are caused by the wind. Moreover, tsunamis do not take after normal waves as they have a much longer wavelength (distance between successive peaks). Diagram of Wave Formation, credited to CSU Geology Department. The waves travel in all directions from the area where the tsunami starts. The speed of a tsunami is controlled by the depth of the water, which means it slows down as it gets closer to the shore, due to the fact that water becomes increasingly shallow. However, the water column behind it is still in deeper water, which means it’s moving faster so it catches up, causing the wave to become a lot higher. The size of the wave is dependent on the physical features of the coastline and the ocean floor. Tsunamis increase in height as they go over gradual, long slopes. Usually, this happens closer to land where water depth is less than 100m. This is known as shoaling. The shoaling effect is what causes waves with the height of about 1m in the open ocean to be able to reach 10s or 100s of metres above sea level onshore. Tsunamis are usually a series of waves, and the first one isn’t always the most substantial, which is the reason for why a small tsunami at one shoreline, can turn into a giant wave at another.  Sequential peaks can be 5-90 minutes apart. If a major disturbance occurs underwater close to shore, the first wave could reach the beach without an issued warning in a matter of minutes. This poses a great risk to areas less than 8m above sea level and within a mile of the shoreline. Although this disaster starts in the water, a tsunami can go on to create havoc on land as its waves and receding waters can be disastrous to any infrastructure in the run-up zone. The most common cause of death that’s linked with tsunamis is drowning but tsunamis can also bring about flooding, contamination of drinking water, and fires from gas lines. In 2011, the Tohoku earthquake struck offshore of Japan. 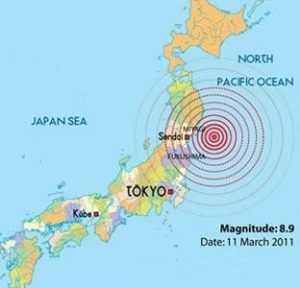 The earthquake was recorded as 9 on the Richter scale, a devastating earthquake that unleashed a ravaging tsunami on Japan. The earthquake occurred due to two tectonic plates colliding at a destructive plate boundary, in particular a subduction zone. The denser Pacific tectonic plate slid under the lighter North American plate. The huge plates came together and became trapped, causing energy to build up as they attempted to release themselves. Eventually the pressure built up and the plates released, causing an earthquake to occur. 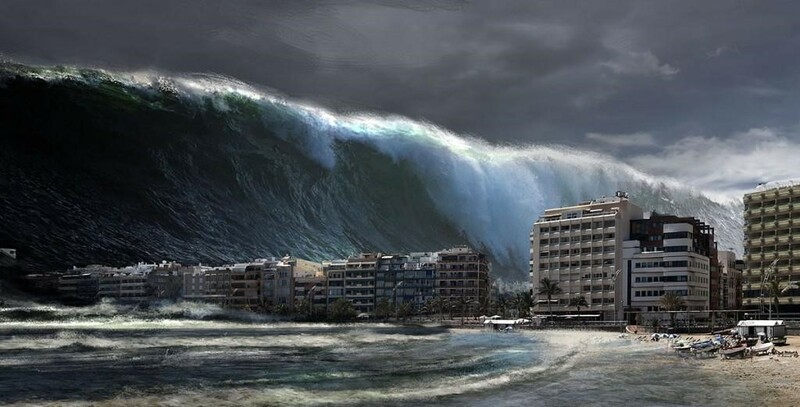 This sudden uplift displaced the water and caused the birth of a tsunami. 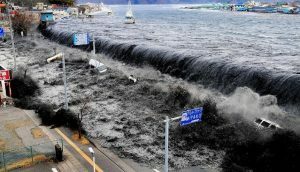 The tsunami was sent crashing into the north east of Japan. In the first 30 minutes a 40m high wave hit the coast, followed by 9 additional waves up to 10m in height. The effects were horrific with over 15,000 deaths according to Japan’s National Police Agency. In addition, 2000 people were injured, 530 000 people displaced, at least 1.2 million houses without electricity or water, 50 000 houses damaged and 32 bridges destroyed. However, one of the most devastating effects was the tsunami causing a system failure at the Fukushima Daiichi Nuclear Power Plant, resulting in a level 7 nuclear meltdown and release of radioactive materials. In July 2013, TEPCO, the Tokyo Electric Power Company, admitted that about 300 tons of radioactive water leaks from the plant into the Pacific Ocean every day. The radioactive material was identified as radioactive isotopes of caesium-134 and caesium-137.